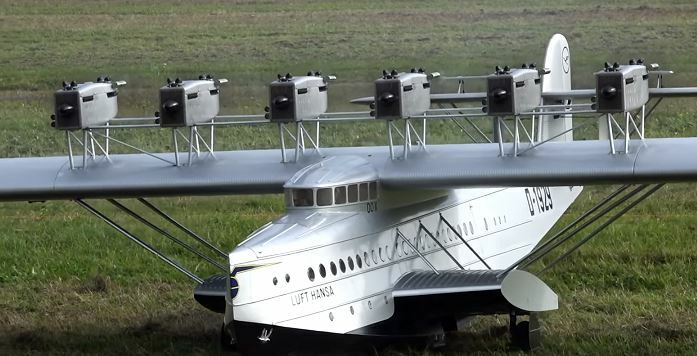 This amazing RC flying boat is the largest and most powerful model of the 1929 Lufthansa amphibian airliner ever built! Shown here at the Friedrichshafen Model Fair in Maßstab, Germany as part of the FMT Flying Stars of the Year show, the 1/10-scale “Wasserflugzeug” is piloted by Michael Bräuer. The Do X has a wingspan of 15.75 feet and weighs 132.28 pounds on takeoff. They really amazing thing about this gigantic flying boat is that it is powered by 12 O.S. .60 4-stroke engines! Mounted with six dual engine pods, (just like the full size aircraft), just watching Michael prep and prime and start all 12 engines is fascinating. The scratch built model uses conventional wood construction and includes retractable landing gear and an amazing amount of scale detail. Truly remarkable! I have 2 questions: Did the original have retractable gear? ie, was it an amphibian. (I suspect not) 2nd: is this model water capable? Thank you. DOX was a flying BOAT no gear.